We’re thankful for the positive reception that yesterday's introduction of the Dell XPS 13 developer edition (formerly project Sputnik) received. Tons of feedback has already started to pour in. One area that we've received feedback on was pricing (see recent stories from Slashdot, Engadget and Gizmodo). Some customers pointed out that the Ubuntu-based XPS 13 was priced higher than the comparable Windows 8 offering on other Dell.com online stores. It was not our intention to price the XPS 13 developer edition higher. To rectify this, we have adjusted the price down to $1,449. We've made the change on the Sputnik Dell.com page for consumer and small office customers (pictured below), and will be updating the pricing on the Large Enterprise Sputnik Dell.com page a bit later today. Update: The Large Enterprise page pricing is now updated as well. 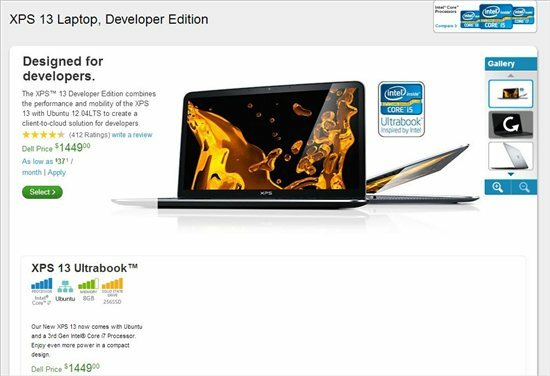 If you want to dig deeper into what this developer laptop is all about, check out Dell's Project Sputnik Repository for more. Thanks for the feedback and keep it coming!